Taken at a railway station in Old Delhi this picture stands for itself. 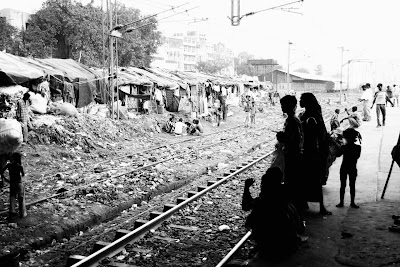 Just have a look how people there are living near the railway track... comment most welcome! Great pics showing real life-fractions of India. On 15th August, three kids, living with their families near railway track, were crushed under a running train. Incidentally, 15th Aug. is marked as Independence Day of India. So..question is : 1. Whose Independence Day does 15th August suggest? 2.Was the fast train symbolises 'fast economic growth and development' of India ? 3. Who will be crushed under the wheels of this 'DEVELOPMENT'?